Sources tell News 8 that Dallas Police Headquarters is under a lockdown Saturday afternoon due to a threat that is being 'taken seriously' by police. No suspect was found after a "systematic search" of the parking garage at Dallas Police headquarters following a threat made toward law enforcement. The search was for a "suspicious person" who was possibly armed. Sources say a man dressed in black was seen in the parking garage. It was not clear if a suspect escaped and was still at large. K9 officers were performing a secondary search of the garage just after 7 p.m.
Police emphasized on Twitter that no shots were fired during the tense situation. SWAT officials earlier "set off a device to enter a locked fence." Officers were preparing to breach a locked door in the parking garage, the department wrote. The tense situation began after police received "an anonymous threat against law enforcement." Dallas PD said it was "taking the threat seriously." Sources told News 8's Rebecca Lopez that headquarters were put on lockdown around 4 p.m. The department wrote on Twitter that headquarters were never placed on lockdown. Around 5:45 p.m., numerous SWAT team members were witnessed swarming a parking garage near Dallas police headquarters with their weapons drawn. Officers said that they were searching for a 'man' in the garage, but did not immediately offer further details. DPD SWAT was deployed to the headquarters after learning of a threat made by a group from Houston claiming to be armed, sources say. 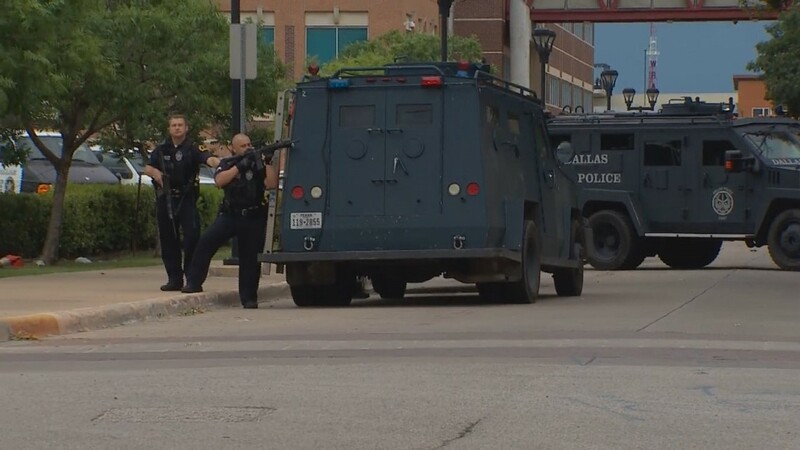 Armored SWAT vehicles can be seen around the perimeter of DPD Headquarters. Officers have initiated a city-wide roll call to make sure that all DPD officers are ok.